The newest version of Android (Oreo, officially) doesn’t bring a ton of new stuff to the mobile operating system, but it does overhaul something near and dear to most smartphone user’s hearts: Emoji. Google has done away with its “blob” style smileys in favor of more traditional-looking (I guess?) smileys, and emoji that in general look more recognizable when compared with their equivalents on other platforms, including iOS. Google announced its emoji redesign back at I/O, its annual developer conference, so we’ve had time to grieve the blobs, but it’s still going to hurt for some fans of the offbeat Google pictographs. Google also seems to have good intentions for the redesign — it wants to both unify the style for a library that has grown immensely since its inception and Better represent diversity and inclusivity among its emoji set. One of its stated goals with this huge overhaul was also to improve communication across platforms. Strange as it might seem to old-school phone users who remember when people used to communicate using voice and text, emoji are actually used often to convey real meaning. Google says it wanted to help avoid miscommunication by helping to make sure emoji are as consistent as possible when used across platforms: Those blobs often seemed to mean very different things from their iOS equivalents. 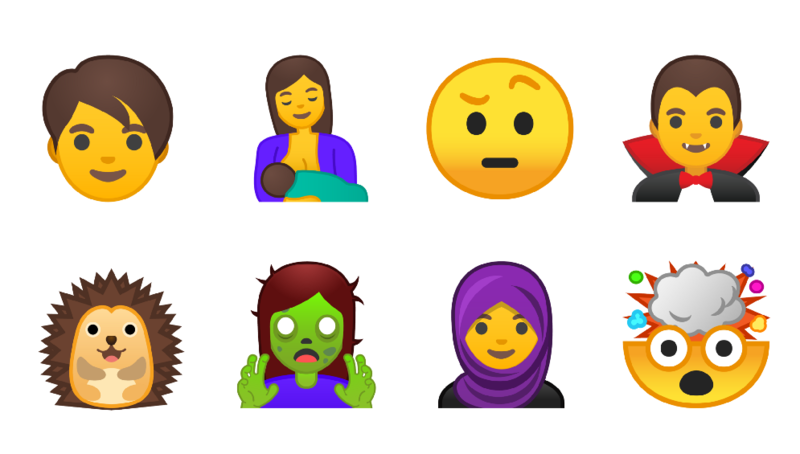 Android O also includes 69 new emoji, as included in the Unicode 10 emoji set. These are focused on better representation of people and gender, as well as some fun fantasy and sci-fi characters and the likely very popular exploding head emoji. The samples of emoji above are just a small taste of the complete redesign introduced in Android O, which include more than 2,000 characters in total. If you want a full sampling, go ahead and check out Emojipedia for the whole enchilada, which is something there is no emoji for (yet).